If you're like me, you may be a little suspicious of some of the Pinterest ideas out there. 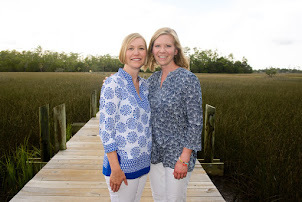 I admit I've looked at a few of the "Pinterest Fail" sites and laughed hysterically at beautifully styled photos next to the disastrous messes those projects became when a real-life person followed directions. Well, I don't have one of those stories to tell here. Today, I share with you a Pinterest success ... 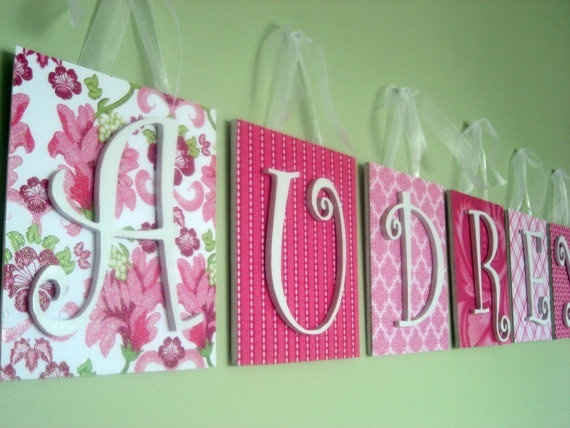 Decorative Wall Letters. The inspiration letters use scrapbook paper and Modge Podge, and I don't like Modge Podge. It's messy and I'm always left with a half-used bottle sitting about, so I chose to use fabric stapled on the stretched canvas instead. It worked! I also purchased the letters. There is no jigsaw time in my life and I will happily pay for letters to save time. With a 2 1/2-year-old, my DIY threshold dictates that the project must be completed within the span of 2 naptimes or it just won't ever get done. I used hot glue to glue the letters to the fabric. 1. Get yourself organized. It took me 2 naptimes to rock out 6 letters. 2. Iron your fabric and lay it face down on your work surface. Lay the canvas face down on the wrong side of the fabric. Use the stapler to attach the fabric to the wooden frame of the canvas, folding the fabric in at the corners as neatly and as flat as you can get it. 3. Measure and cut the ribbon for each of the canvases. Attach the ribbon to the canvas using the staple gun. 4. Attach the wooden letters with a hot glue gun (this should work whether your letters are wooden or paper). Let them dry for a few hours before hanging to make sure they're secure. 5. I hung the letters using a simple carpentry nail, but you could also use no-mark hangers. I played with the ribbon a bit to cover the nail; you could hot glue a cute button or knob to the end of the nail if you want to embellish it. Ta-da! 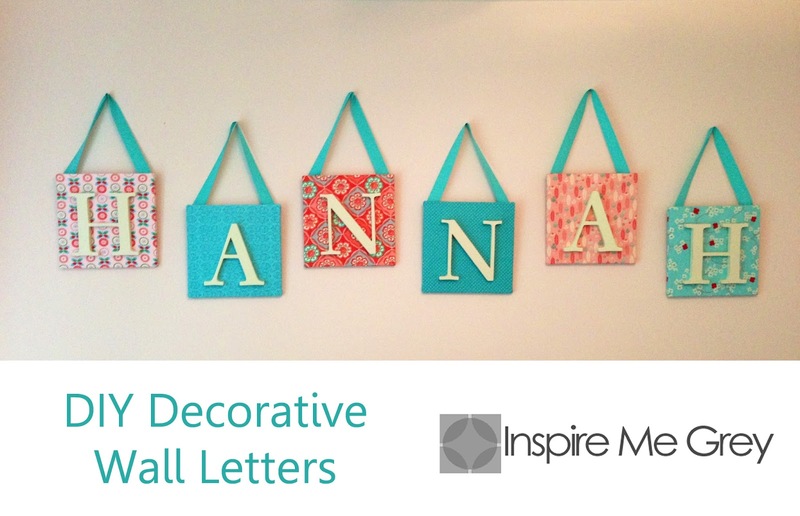 These letters on canvas are a great way to incorporate coordinating fabrics into a bedroom, no matter what age your kiddo may be.